Finches on cherry blossom branches on floral background. 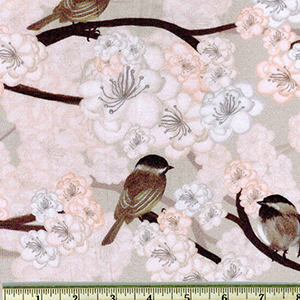 For reference, each bird is 1.5 to 2.5 inches tall with a fabric repeat every 12 inches. Brown and white finches on cherry blossom branches. 50% MODAL RAYON, 45% Cotton, 5% Elastane. New, straight from the bolt, 68 inches wide, continuous yardage. Tissue to Light Weight fabric It has a light hand, good for lingerie, tank tops and other light weight clothing. Super soft fabric, but not slippery. From the Avalon Jersey Print fabric collection from Robert Kaufman Fabrics.